The London production of Wicked has been running for three years, and the most recent cast change is its fourth. Watching it for the first time, however, you would have no idea, as it is so sparkling and fresh that it looks as if it is at the start of its run. The performances are both strong & assured; the costumes are immaculate; and the energy breathtaking. The result is a perfectly balanced emotionally involving and politically subversive musical that tells the back-story of the relationship between the Good Witch, Glinda, and the Wicked Witch, Elphaba. It explores ideas of social & political power by questioning one of the defining totems of evil in 20th century mass media: the Wicked Witch of the West. Wicked is adapted from the 1995 book by Gregory Macguire. Whilst the book preceded Harry Potter, Wicked the musical is definitively post-Harry. Shiz University, where Glinda and Elphaba study, is its own Hogwarts. Its head Madam Morrible – who is played as equally funny and scary by Harriet Thorpe – is rather like Dolores Umbridge from The Order of the Phoenix. There is also an air of contemporary American culture in the mix. Glinda gets the Elle Woods treatment in the script. That said, Dianne Pilkington creates a character more St Trinians than California University of Los Angeles. Yet it is not the setting that provides the story of Wicked. It is the relationship between Glinda and Elphaba, and the forces that drive them. Wicked opens at the end of the story, after the Witch has been killed. It is the familiar world of MGM’s The Wizard of Oz. The townsfolk turn to Glinda to make sense of the events in a wonderfully choreographed opening sequence. ‘Are people born wicked, or do they have wickedness thrust upon them?’ she asks, tongue-in-cheek. The question is not tongue-in-cheek, however, and the following action hinges on it. When a voice in the crowd asks if she and Elphaba were indeed friends the action returns to the beginning, to when the two women meet. This is astute writing. In fact, Wicked is remarkably well structured. Winnie Holzman, who wrote the script – or The Book as the parlance would have it – created the TV series My So Called Life, and has written for thirtysomething. The characters of Glinda and Elphaba are a well-balanced comedy duo, and in some ways Wicked starts out as a sort of High School Musical in Oz. Yet because one knows the ending, and because there are signs of social and political instability in Oz, there is a dark undercurrent that adds depth. In simply knowing that Elphaba will turn out to be the Wicked Witch of the West, one is from the start on guard for signs of how she will end up that way. And herein lies the subversion. The questioning is an important part of the process. To carry this off it is fundamental to have strong, dynamic lead actors. Dianne Pilkington’s performance as Glinda is an assured one. The comedy in the character of Glinda is in the fact that she is all surface. Yet that surface is an act, and her character arc would not make sense if that were not so: Dianne manages this beautifully. The character of Elphaba requires a balancing act of a sarcastic and an earnest nature. Alexia Khadime, who returns after playing the role for a six-month stint in 2008, gives a commanding performance. Wicked is about finding one’s voice. Elphaba finds this at the end of the first act, after the pair arrive at the Emerald City and find out to what extent the Wizard is undermining the political stability of Oz. It is a powerful moment. Alexia’s performance of ‘Defying Gravity’ at the close of the act is spine tingling. Events turn dark herein, and in the second act spiral out of control. 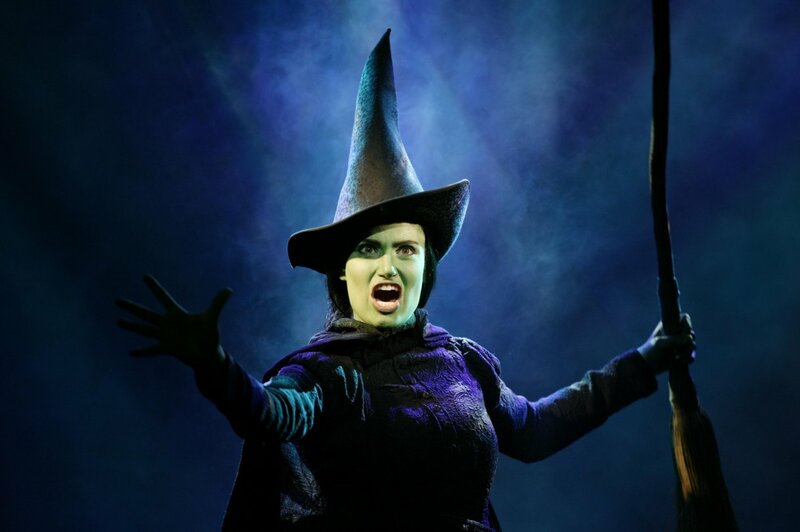 The lengths to which Elphaba, the green & magical child of two worlds, is driven by the manipulations of those in positions of power, is pure tragedy. Her power is fuelled by rage, and it is naked in its application. The power wielded by the Wizard and Madam Morrible, is driven by guile, deception, and manipulation. The Wizard, delicately played by the excellent Sam Kelly, is a humbug who exercises a real political danger. Yet there is hope in the relationship Elphaba forges with Glinda. In fact, the love song between Elphaba and Fiyero, ‘As Long As You’re Mine’, is not the signature love song of Wicked. It is the platonic love between Elphaba and Glinda that is the real subject of Wicked, and it is celebrated in the signature love song ‘For Good’. It is Glinda who has, in the end, the power to change things from the inside. This gives a poignancy and sadness to the final duet, ‘For Good’. Alexia and Dianne play this beautifully, and communicate that balancing act between possibility and loss to perfection. It is a beautifully crafted conclusion. When they are singing together all else falls away. Nothing detracts from the intensity of their performance. With a production that is reliant on comedy and heightened emotions, it is best seen from the stalls. One feels more of an observer from the dress circle, but from the stalls one is more immersed, and the experience more rewarding. A criticism I have of the production is that the quality of the sound is not as clear as it should be, especially in the higher ranges, and again this is more noticeable in the dress circle. Wicked has a heart, courage, and a brain. It is a remarkable achievement that demonstrates the power of the musical to ask questions about the world we know and, ultimately, to leave one feeling changed.